This section contains custom figures of characters found in Episode 1 - 3 of the Star Wars saga. With the release of the Clone Trooper Order 66 four pack from Entertainment Earth, I decided to make the Commanders to go with these troopers. Since Commander Cody was already released by Hasbro, that left me with three Commanders to create myself. I was able to acquire a set of solid white Clones from an online dealer and these made a great base for the creation of the custom Commanders. First of the three custom clones is Commander for the 442 Siege Battalion. 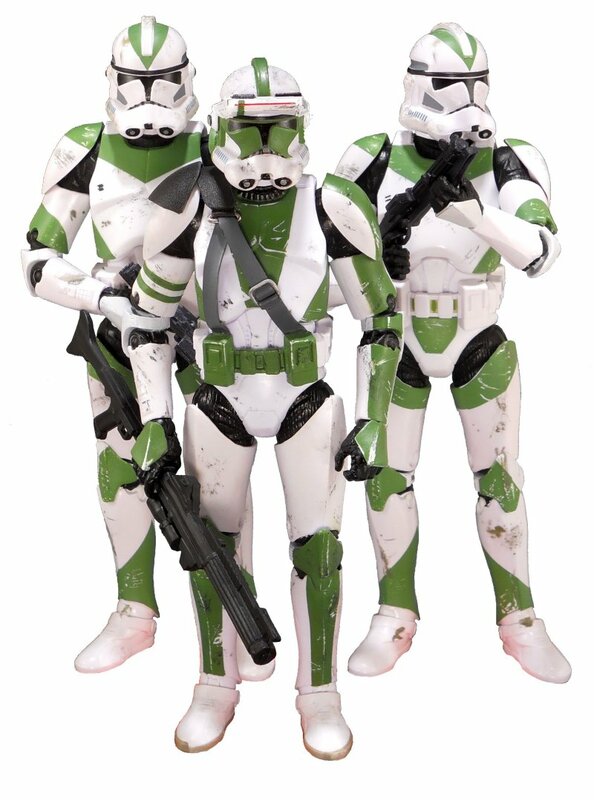 This unit of clones was only seen in pre-production photos and was not present in the movies and as such no commander for them was ever shown or named. 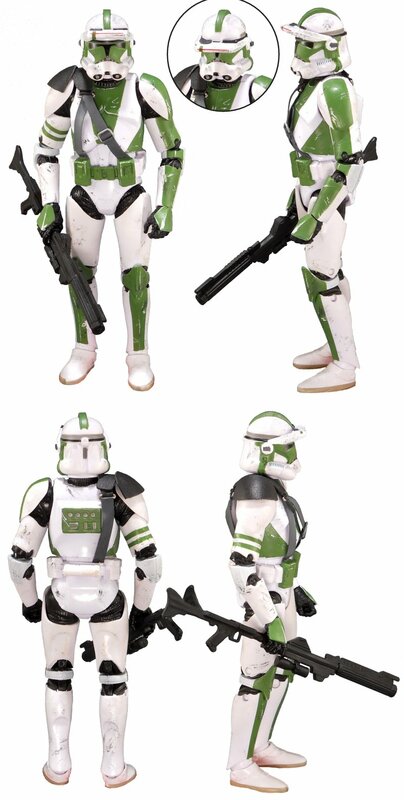 I designed the color pattern for this clone myself and named him Commander Stone, his equipment is based on some of the other Clone Commanders seen in the movie. The binocular visor on his helmet is taken from a Bandai Clone Trooper model kit, which I installed with a pivoting joint on either side so it can be raised and lowered. The shoulder harness is custom built from some soft plastic straps and metal buckles attached to the belt so it will accommodate movement of his torso and shoulder. The shoulder plates are made of pieces cut from a dvd case that I heated and shaped as needed. Some various shots of Commander Stone. Commander Stone with his 442nd Battalion Troopers. The second figure for my Clone Commander project is Commander Fox of the Coruscant Shock Troopers. This one was quite a bit more involved than Commander Stone and required quite a bit of fabrication. 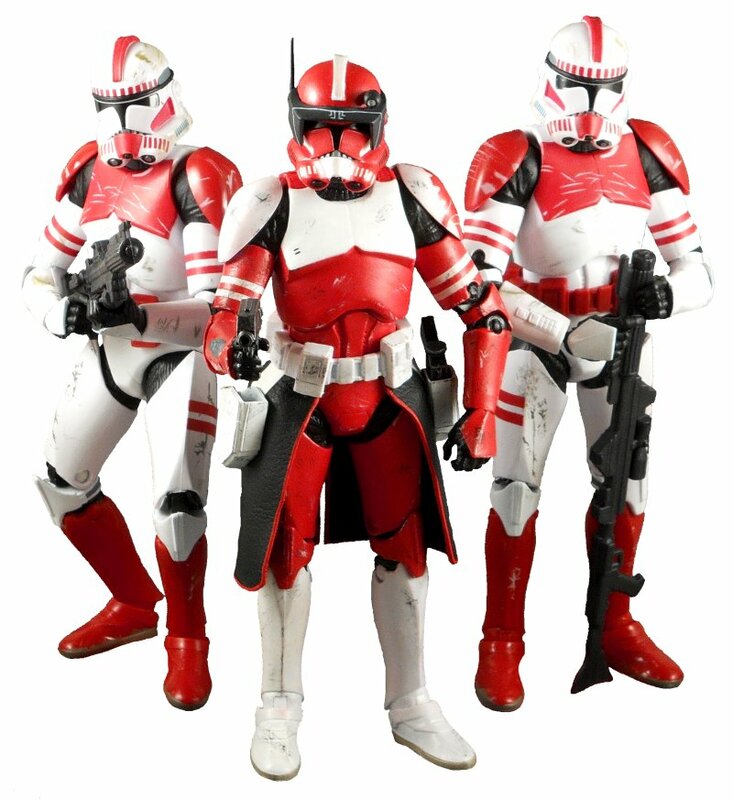 Paintwork for this one is the direct opposite of a basic Shock Trooper with the red and white colors reversed. The visor for his helmet is a recast of the Commander Cody visor added to a standard Phase 2 clone helmet. The antenna and forehead scope are both custom sculpted and glued into place. His waist cape and pistol holsters had to be made completely from scratch. I created the cape from some pieces of thin black leather, and attached them to the underside of his belt. The pistol holsters are built from pieces of thin plastic card glued together and sealed with sculpting putty. The holsters are attached to the belt by white strips of vinyl and glued into place. The pistols themselves are 3D printed models purchased from an online dealer. Some various shots of Commander Fox. Commander Fox with his Shock Troopers. When the Guardians of Evil 4-pack was released it came with an Imperial Royal Guard, a First Order Praetorian, a Shadow Guard, and a Republic Senate Guard. Since the Emperor Palpatine and Supreme Leader Snoke already exist as figures, most of these guards had someone to look after. The Senate Guards however were left standing by themselves due to a distinct lack of Prequel era characters. I wanted to make a Republic Diplomat so the Senate Guards would have someone to display with, and decided to make a Twi'lek female since I happened to have all the right parts to build one. This figure is loosely based on the Twi'lek named Supi from Episode 2, with some variance required due to a lack of choices in fabric for her dress. The body is made from a leftover Episode 4 Princess Leia that I had lying around (from the awful monkey face version), and a head from the Hera Syndulla figure. I removed Hera's goggles and sculped the headdress and ear cones over her flight cap, then repainted the whole thing with a brighter shade of green and different facial details. For the body only the upper torso, shoulders, forearms and hands needed green pant. The dress was the tricky part since I am not very experienced with making cloth goods. I opted to assemble the clothing using rubber cement rather than sewing since it would avoid the stitch lines and allow me to piece the clothing together right onto her body for a better fit. The burgandy dress is actually two parts, with the part over her breasts being separate from the lower portion so she will retain the ability to articulate at the torso joint without bunching up the dress. The outer robe was assembled form three pieces for the body and once piece for each sleeve. The sleeves and lapel are both lined with burgandy fabric. Some various shots of the Diplomat.